Now we know this sounds totally crazy and over indulgent but we recommend that you invest in a silk pillow. Silk pillow cases have been recommended by top dermatologists as they keep the natural moisture in our skin. It all sounds very scientific but in a nutshell because the moisture levels are being maintained throughout the night, deeper lines and wrinkles are not forming. Silkskin is a living, breathing product containing the proteins and amino acids that are identical to those in the skin. The natural, organic skin care products also have the same ph balance, which helps to protect, and maintain moisture levels. Silkskin is also good for preventing ‘bed head’. 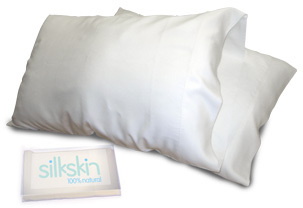 Using natural Silkskin pillow cases allows hair to glide across the pillow case without getting caught. Regular cotton pillow cases can get the hair caught and cause breakage, especially if you toss and turn a lot while resting.